The Miami Marlins' slugger set the franchise record with his 43rd homer of the season on Monday night, his 10th in the past 11 games. Throughout the first half of the season, the baseball world was captivated by a pair of rookie sluggers who clubbed their way to the top of the home run leaderboards in their respective leagues, the Yankees' Aaron Judge in the AL and the Dodgers' Cody Bellinger in the NL. Cast as a younger, larger version of the Marlins' Giancarlo Stanton, the 6'7", 280-pound Judge hit a 495-foot homer, made the cover of Sports Illustrated and won the Home Run Derby title in Miami. The 21-year-old Bellinger was called up on April 25 and produced six multi-home run games before the All-Star break. But since the Midsummer Classic, the 6'6", 245-pound Stanton has reclaimed his throne as the most fearsome power hitter in baseball. On the strength of a remarkable stretch of home runs, he has overtaken both rivals for the major league home run lead, set a new career high and is now aiming for some particularly rarefied air. 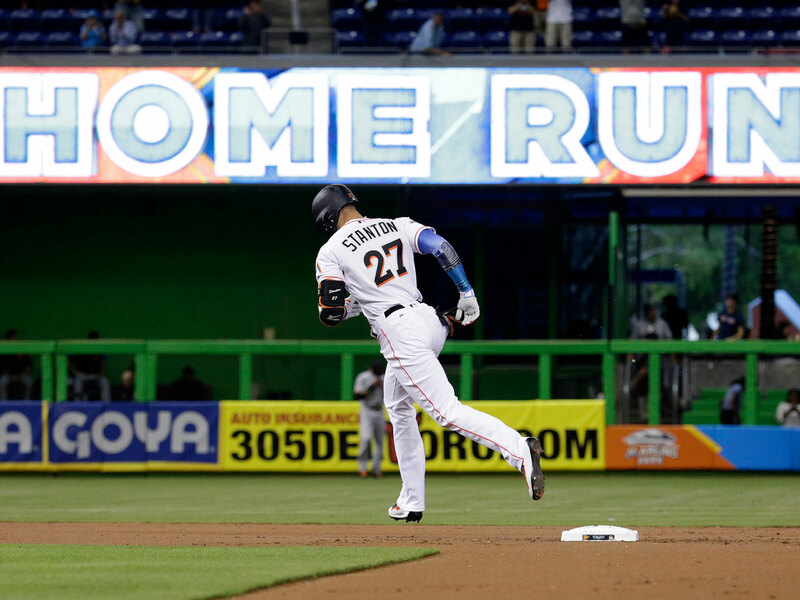 On Monday night at Marlins Park, Stanton hit his 10th home run in his team's past 11 games in an 8-3 win against the Giants. It was also his 16th of the second half and his 22nd since July 5, giving him a franchise-record 43 on the season. Even for a player whose prodigious power has been his calling card since arriving in the majors in 2010, this is an incredible display. The now-27-year-old Stanton set off a fireworks show in last year's Home Run Derby in San Diego, winning it for the first time, but even so, his season was like so many others in his career—abbreviated. He played in just 119 games because of injuries, his fourth season out of five with fewer than 145. From 2012 to '16, he averaged just 115 games per year, and he's led the league in home runs just once: 2014, when he hit 37. Last year's 27 homers matched his total in just 74 games in 2015 (when he missed more than half the season due to a fractured hamate), while his .489 slugging percentage represented a drop of 117 points from the year before. Though overshadowed by Judge and Bellinger, Stanton quietly started 2017 very well, homering seven times apiece in April, May and June. In the final week before the All-Star break, he hit five in five games, bookended by multi-homer outings against the Cardinals and the Giants. The burst propelled him past Bellinger and into a tie with Joey Votto for the NL lead at the break with 26, four fewer than Judge had in the AL. It took Stanton a few days after the break to resume his slugging, but beginning with another two-homer game on July 17 against the Phillies, he's been on the kind of tear that usually involves video game cheat codes: 17 homers in his last 26 games, a 106-homer pace over 162 games. That includes homers in his last five games, matching the longest streak of his career, set from August 14-17, 2011. Stanton's blast on Monday moved him past Gary Sheffield's 1996 total for the most in Marlins' history and has left the rest of this year’s field in the dust; Judge, who also went deep on Monday against the Mets, leads with AL with 36 homers while Bellinger's 34 is now a distant second in the NL. If Stanton were to merely finish out the year maintaining the same rate of home runs per game as he did through the first three months, he'd finish with 55, the most in the majors since the Phillies' Ryan Howard hit 58 in 2006. However, reaching 60—which only Babe Ruth and Roger Maris have done outside of the Steroid Era—would be tough, and catching Barry Bonds' single-season record of 73 would appear to be all but impossible. To tie Bonds, Stanton would have to hit 30 homers in the Marlins' final 45 games, a 108-homer pace—similar to what he's done over the past month but all but impossible to sustain—if projected over a full season. Speaking of Bonds, as I noted last week, Stanton is the lone active player under age 30 with at least 200 homers; he has 251. Having his first 40-homer season under his belt would appear to be a necessary precondition for anyone hoping to mount a threat to Bonds' career record of 762 homers; for Stanton, it will take 12 more such seasons and change, giving him a shot at the record in his age-40 season. Of course, that's one heck of a longshot, but it's worth noting given that the only other players young enough and with enough dingers in the bank to be in that particular conversation are former MVP winners Mike Trout (26, but still in his age-25 season; 191 home runs) and Bryce Harper (24; 150 home runs and recently sent to the disabled list with a knee injury) and Bellinger (21). Speaking of long shots, with Stanton it’s not just about home run totals, it's about distance. Via Baseball Savant, his average home run entering Monday's game projected to 418 feet, tops in the majors among those with at least 25 homers and second among all those with at least 10, trailing only the Rockies' Mark Reynolds, who has the advantage of playing in high altitude Colorado. An MLB-high seven of Stanton's 43 homers have gone at least 440 feet, as many as the combined totals of the second-ranked Wil Myers (four). Even with the time he's missed, Stanton's 15 such homers over the past three seasons—the Statcast era, so to speak—is tops, ahead of the 12 by the Mariners' Nelson Cruz. He has four homers of at least 470 feet in that span, as many as the combined total of Cruz and the Dodgers' Joc Pederson, the only other players with multiple long-distance shots, and to date, the 504-foot homer he hit off the Rockies' Chad Bettis in Colorado last Aug. 6 is the longest of the span. Stanton's latest burst has come against the backdrop of the sale of the Marlins' franchise; on Friday, it was announced that a group headed by financier Bruce Sherman, with Derek Jeter on board as the CEO, has agreed to purchase the team from Jeffrey Loria for $1.2 billion. What remains to be seen is whether the new owners will hold onto Stanton, whom the Loria regime signed to a record-setting 13-year, $325 million extension in November 2014—more than double the amount that the team contributed to the building of Marlins Park. The deal is heavily backloaded; Stanton is making just $14.5 million in salary this yea before the figure jumps to $25 million next year. While just about every team could use Stanton, the general feeling in the industry is that if Miami wants to do more than dump Stanton's salary in order to jump-start the franchise out of its mediocrity, it will have to eat a hefty portion of that in order to boost the quality of players it would receive in return. Stanton's latest hot streak only raises the stakes for such a trade, though at this point, it's not something likely to happen this season, even given the reports that he has passed through waivers. In the meantime, we should just enjoy the fireworks he's setting off, because peak Stanton is a rare and wondrous sight to behold.